Dodge has come up with an innovative way to generate excitement around their new Ram 1500 pick-up. Recently at the Bloomsburg Fair in Pennsylvania they put the truck on show and allowed people to ride on it through a series of challenging obstacles. It was an incredible experience. One which the spectators and participants won’t soon forget. The excitement was palpable as event-goers rode the Dodge Ram 1500 throughout the large dirt area. The spectators saw the Dodge Ram navigate a wide range of terrain at different speeds. This display shows just some of the things the Dodge Ram 1500 can do. Dodge turned the fairgrounds into a mini monster truck show and the star of the show was the Ram 1500. The fair featured horse pulls and livestock judging, but large crowds surrounded the area where the Dodge Ram was put through its paces. It was a truly festive atmosphere with live bands, ethnic food and carnival rides. But the one ride everyone wanted to experience was inside the Ram 1500. The participants didn’t have to drive the truck. It was more like a carnival ride. But it ran through mud holes, ditches, water and all kinds of surfaces people might encounter when they go off-roading or are using the truck to work or play in all kinds of weather. That part of the nation is farm country which means pick-up trucks are plentiful. The demonstration was not lost on the local farmers, farm hands and spectators. By the reaction of the crowd they were duly impressed. This is no easy feat because there are more second and third generation pick-up truck owners here than in many other parts of the country. 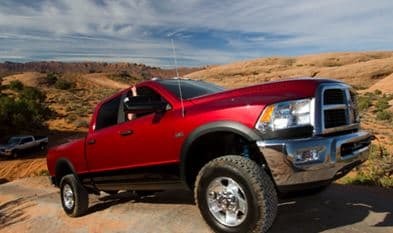 The course had the Ram 1500 driving at a 30 degree angle, taking a series of S turns to display the turning radius of the truck and wading through pools that came up to the truck’s rocker panel. The trucks rode through a series of pits that showed the Ram’s ability to maintain traction with one corner in the pit and the other off the ground. The Ram 1500 also showed off its hillside holder feature by stopping on a steep uphill slope and climbed over logs display its ability to crawl in 4-low. The crowd was impressed which is hard to do with hard working people who use pick-up trucks every day and have for years. ← Will Cummins Revive Titan?